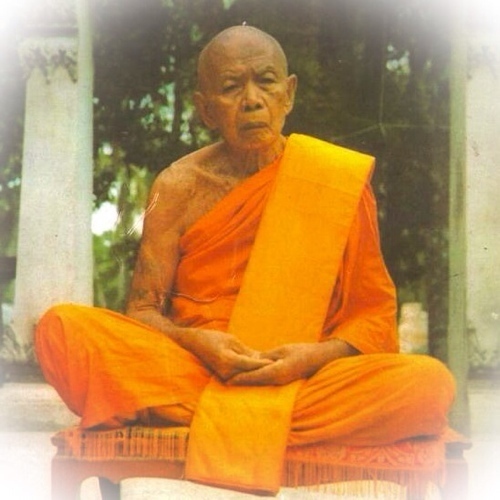 Pra Khun Phaen Prai Kumarn Pim Song Pol Yai, in Nuea Khaw Hniaw Sukh Pasom Pong Prai Kumarn Long Sai Rae Tong, withTakrut Maha Bpraab in rear face, by Luang Phu Tim, of Wat Laharn Rai. 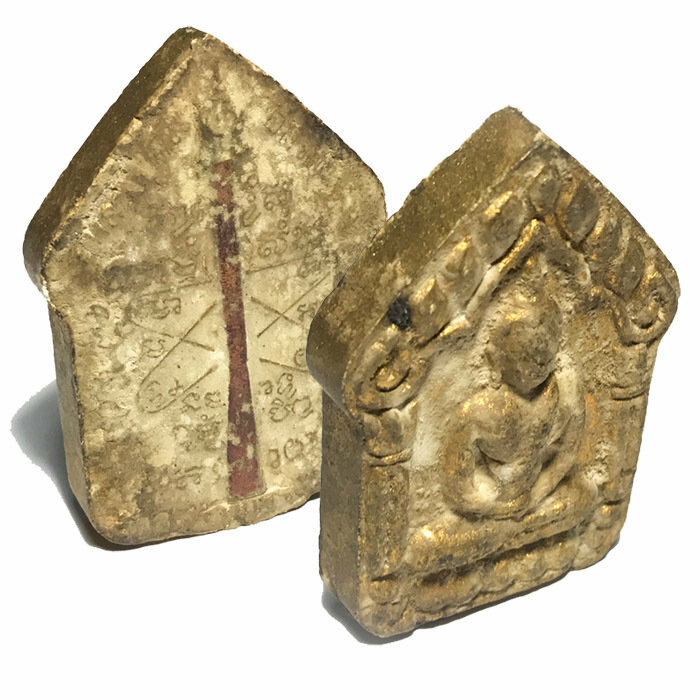 This amulet was taken to Doctor Pisek along with our other amulets of Luang Tim on Saturday October 14th 2017 by Ajarn Spencer Littlewood, to receive confirmation of authenticity, and was confirmed and categorised by Doctor Ajarn Pisek Sri Sawad, as being a Pim Song Pol Yai Nuea Khaw Long Sai Rae Fak Kru. 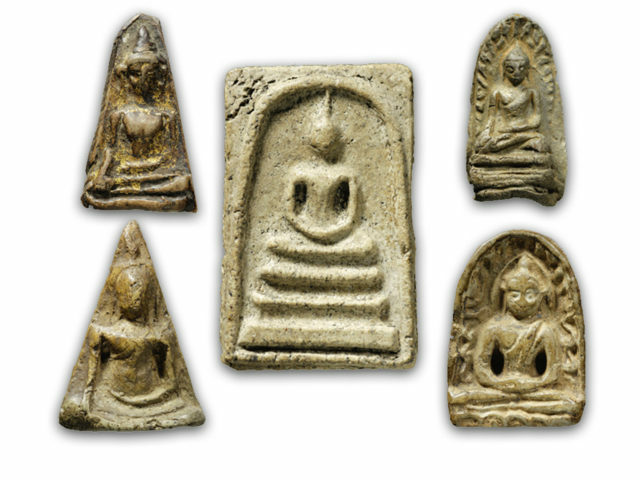 These models were pressed in the years between 2510 and 2515 BE on a constant basis, and many were buried in Kru chamber for charging up and later removal for distribution. These Monopolists at first made claims that the 2616 BE series was fake, but were soon brought to their knees both by independent groups and publications, as well as the original Looksit Aek who were there ate the time to see them made, came out into the pubic eye to reveal ther truth, along with confirmable evidence which they presented, including photographic documentation of themselves collaborating in the presence of Luang Phu Tim, in the years between 2505 and 2515 BE. Below; Second from left - Nay Chamaeng - who was the head of the assistant Looksit who helped to make and press the Khun Phaen Pong Prai Kumarn Pim Yai Block raek Pim Niyom, came out and added his confirmation to the fact of the reality of the 2505, 2509, 2510 and 2515 BE editions. Certification and Competition entry has now become commonplace as collectors gather to form their groups and competitions, and new encyclopaedic catalogs are now in circulation, sealing the doors on what was once a monopoly, but has now become a trap which the monopolists created for themselves. has become one of the hottest prospects of the decade. Now is the time to study and collect, for the near and far future will make the Block 2 Edition as unaffordable as the Block Raek has become in the present day. 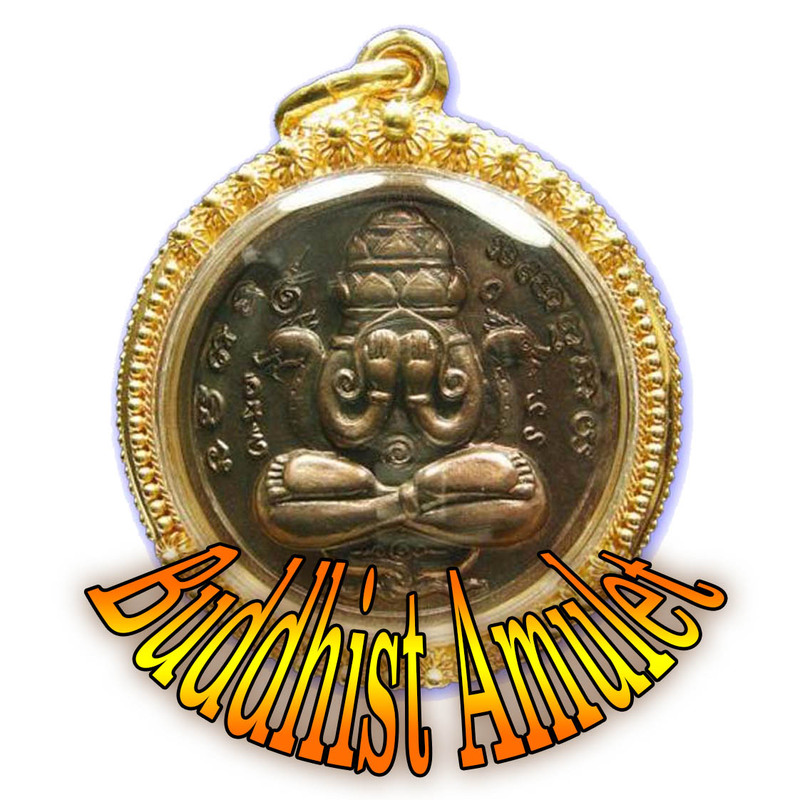 This amulet is presented in the below HD video with an extensive and highly informative narrative from Ajarn Spencer Littlewood, with which you can inform yourself of the nuances of this series, and view the close up details of the features and aspects of the Pim and its Muan Sarn composition, of the admixtures within the Sacred Clay. The rear face has two Takrut (Sariga) inserted into the Yant Grabork Khwai Yantra - this Pim featured another model with single takrut Maha Bpraab pressed in the same block press too, which is less preferred, and carries a slightly lower price tag to the twin Takrut Sariga version, with the exception of some special Ongk Kroo versions which have solid gold Takrut insert. 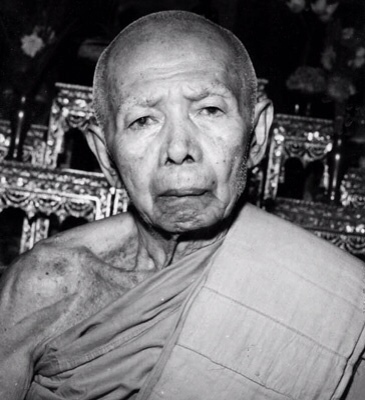 Below; Pra Khun Phaen Pong Prai Kumarn Block Tong Hlueang (Block Sorng Pim Sum Khad) of the 2515 BE Edition, another until recently unknown, and at first disputed edition. 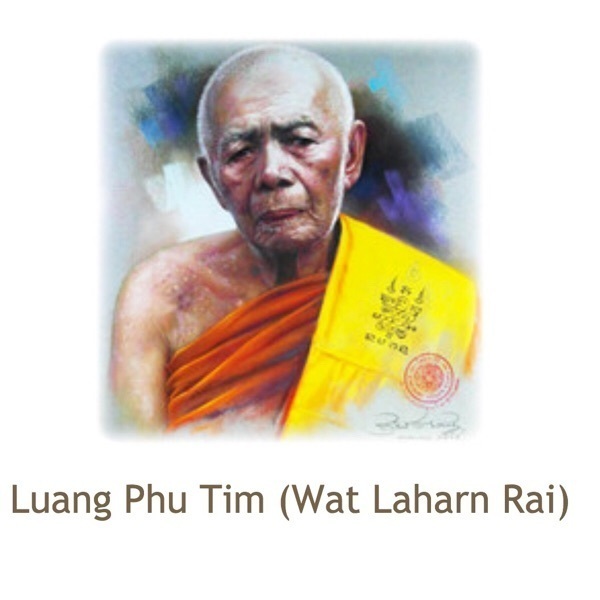 Since recent years, some of the aged looksit of Luang Phu Tim have revealed many unheard of facts about the Pra Khun Phaen Pong Prai Kumarn of Luang Phu Tim, making public knowledge of the many different Pim and Block presses more widespread, and breaking the tight grip monopoly of the 'Sian Pra Niyom' Experts, and opening up the truth which has been deliberatly hidden by a few powerful monopolists who have controlled the information available about all the many models which were actually made by Luang Phu Tim.